Jesus-Islam » Jesus Christ » Where did Jesus say, ‘I am God worship me’? Eric asked my friend Mustafa one day where he was from. ” Guess ! “He said. “From Pakistan,” said Eric. ” He had missed! “Here are some clues: my mother tongue is Arabic; My country of origin is a former French colony, it is ruled by a king, it is in the north-west of Africa, a few cables from Spain from which it is separated by the Mediterranean Sea. Our national dishes are couscous and tajine. Its capital is Rabat … ” “I’ve got it, you are Moroccan!” said Eric quickly. He was right. Even if Mustafa had not literally told him that he was Moroccan, thanks to his clear description, Eric immediately knew where he was. It is the same with what Jesus said. It was the same with the religious people who heard the declarations of Jesus. He declared that he is God. How? Did He say, “I am God”? No! But His answers led the Jews to understand completely what He was saying. He attributed all the unique divine titles to God. He also said he was ONE with God the Father. Each time He spoke, the Jews knew what He was saying. This alone explains their fury and their motivation in condemning Him to death. In their eyes, he was guilty of blasphemy. After his arrest, Jesus was taken before the Sanhedrin (the supreme Jewish political-religious tribunal). Caiaphas, the high priest, asked him this simple and direct question: “I admonish you by the living God to tell us whether you are the Christ, the Son of God.” Without any hesitation, Jesus replied: “You have said it” (Injil, Matthew 26:63 -64). The next day, Jesus was again brought before the Sanhedrin. The interrogation was summed up in one question: “Are you then the Son of God?” And Jesus answered, “You say it, I am.” (Injil, Luke 22:70). These words provoked the anger of the authorities who attacked him to kill him. On both occasions they accused him of blasphemy. “He blasphemed! What else do we need for witnesses? Behold, you have heard his blasphemy.”(Injil, Matthew 26:65). Their question was not, “Are you one of the sons of God?” or, “Are you a child of God?” If this were the case, the Jews would not have reacted so violently. But they had grasped the meaning of what Jesus was telling them by designating themselves as the Son of God, because, as Muslims agree today, to claim to be the Son of God, is to claim to be equal with God Himself. On other occasions, Jesus spoke to God, calling him “My Father” (Abba). He clearly showed his unity with God his Father. Once, the Jews said to him, “If you are the Christ, tell us openly.” Jesus answered them, “I have told you, and you do not believe … I and the Father are one.” The Jews “gathered stones again to stone him. 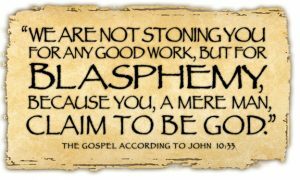 When Jesus asked them why they did so, they said, “It is not for a good work that we stoned you, but for blasphemy, and because you, who are a man, make you God.” (Injil, John 10:22 -33). The Jews, once again, understood the significance of Jesus’ assertion. The eternal Son of God is God Himself. Was Jesus a prophet? Certainly. Was he merely a prophet? No. Much evidence in the Bible shows that Jesus is both Man and God. During his earthly ministry, he demonstrated that he possessed attributes and characteristics exclusive to God. He alone reveals to us the true nature of God. He said and did things that only God can say and do. He has divine names. He can forgive sins and transform lives. He is One with God in perfect unity. He can do everything, he knows all things, he is just and right. He is the only one who has lived without sin. The Koran at least agrees that He had a sinless nature (Sura of Mary 19). He performed many miracles by his own authority: he raised from the dead, healed the paralysed, the blind, the dumb and purified lepers. He chased demons, stilled the storm, fed thousands of people with five loaves and two fish. He never reproached those who worshipped him for doing so. He accepted their worship as something legitimate. All these things are proofs of his divinity. In the light of all this, how can we still claim that Jesus never said he is God? If God chooses to reveal Himself to men in this way, it is because He is certainly capable of it. To say that God could not possibly do this would be to deny His omnipotence, which would itself be blasphemy. After all, how can we accept the fact that demons have the power to take another form (human sometimes! ), but then refuse the idea that God can become incarnate as man, with a human soul and body? If God decides to do it, could anyone or anything stop Him? Absolutely not. The question is, “Why did God come into the world as a man?” This is an important and legitimate question. Why would God come Himself, rather than simply sending someone. The answer is worth seeking. Other questions about Christ build the answer to this question.